As a 10-year survivor of Stage 3c colon cancer, I've had many years to reflect not only on the physical effects of this disease, but also on the mental and emotional changes that have led me to truly understand the meaning of living every moment as if it were my last on earth. I have been remiss in journaling these past two years. However, I plan to write more frequently in the weeks to come...I hope you visit again soon! Attend National Colorectal Cancer Round Table (NCCRT) annual meeting in Bethesda, MD. Receive and donate NCCRT Blue Star Challenge Award of $3,000 to Colon Cancer Alliance's Blue Hope Prevention Award program. 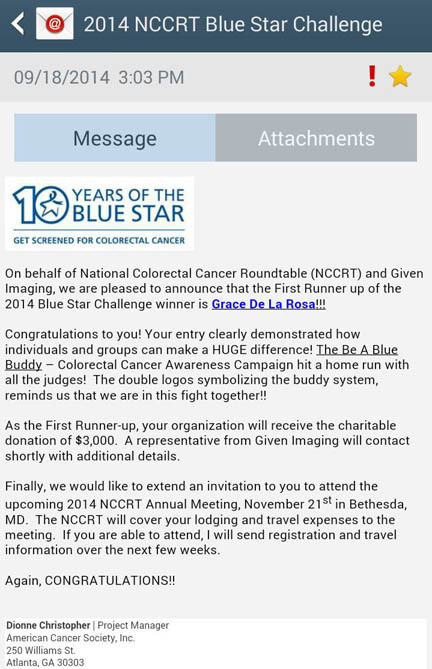 I'm so honored and pleased to be awarded first runner-up in the 2014 National Colorectal Cancer Round Table (NCCRT) Blue Star Challenge! Thanks to EnFocus Media for designing Be a Blue Buddy's logo, I will be donating all $3,000 of the charitable proceeds to Colon Cancer Alliance (CCA)'s Blue Hope Prevention Award, funding for individuals and family members for colorectal cancer screening-related issues. My sister shared a wonderful quote with me; a quote that truly tugs at my heart strings and reflects how I feel each and every time I can be of service to the colorectal cancer community, whether it's by corresponding with newly diagnosed patients or their family members through my online cancer journal, social media, or CCA's Buddy volunteer program, and by speaking with groups and organizations to help raise awareness and educate the public about colon cancer, the importance of screening and early detection. Credit: Be a Blue Buddy logo design by Bernardo Santana III, EnFocus Media.